TV talent show The Voice is attracting a huge audience here at home but none quite so big as our Female Food Heroes competition, as Voice judge and Oxfam ambassador Sharon Corr discovered on her recent trip to Tanzania. 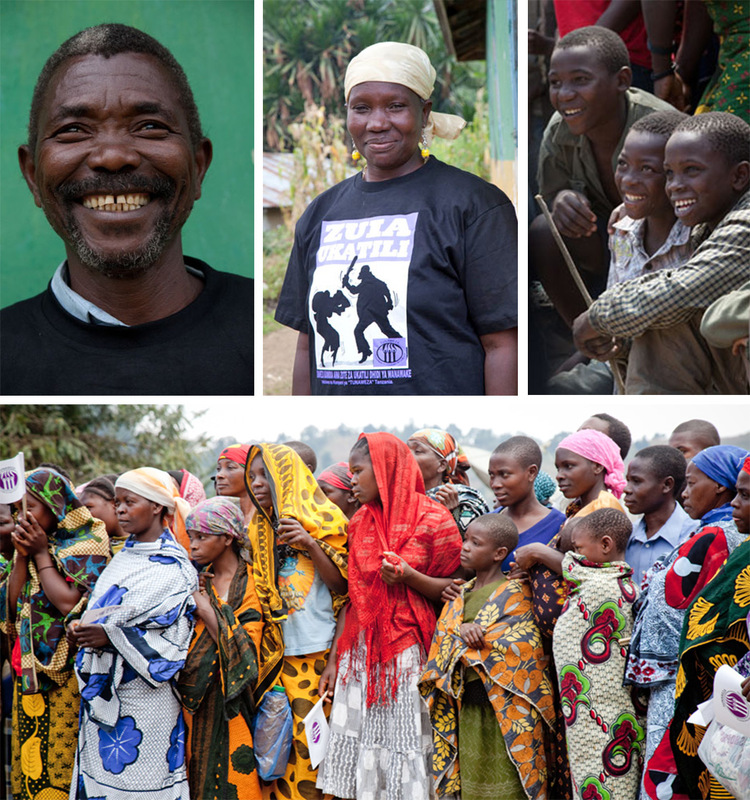 Using reality TV, radio, newspapers and text voting, the initiative has reached 25 million people – more than half of Tanzania’s population – and plays a vital role in strengthening the status of female farmers. The 2012 competition – which Sharon Corr helped to launch – partnered with popular show Maisha Plus and saw 14 finalists selected from thousands of entries. 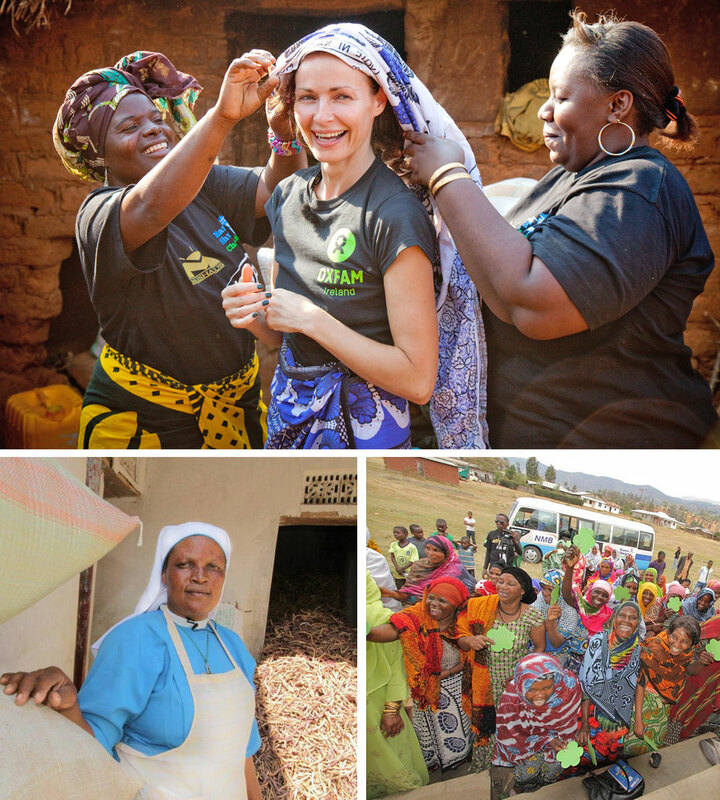 Clockwise from top: Previous winner Ester Jerome Mtegule and Oxfam Ireland’s Mwanahamis Salimu present our ambassador Sharon Corr with a traditional African headscarf at the launch of last year’s Female Food Heroes competition in Tanzania. Barry McCall/Oxfam. The Female Food Hero 2012 competition tours a village in the Lushoto Mountains region in northeastern Tanzania. Thousands of female farmers entered. Oxfam/MaishaPlus. 2012 winner Sister Martha Waziri transformed unwanted wasteland into a successful farm that feeds her local community, including 12 orphaned children. Oxfam/MaishaPlus. Selected by public vote for the ways they’ve helped their communities, the finalists moved into a reality TV village and shared their skills with young people from urban areas on the show, which also helps to highlight the struggle women can face surrounding the ownership of land. With International Women’s Day taking place this week and lots of our amazing supporters getting ready to host Get Together events to celebrate, we’d like to introduce the eventual winner, Sister Martha Waziri (45) from Dodoma. As a 17-year-old she found some barren unused land that none of the local men wanted. But when she asked the local authorities if she could use it, they laughed at her. “I became an object of ridicule,” she recalls. Eventually, she fought and got her way. She has since turned 18 acres of unwanted wasteland into a thriving farm, growing sugarcane, sweet potatoes, bananas and more. In doing so she has become a beacon of change for other local women, many of whom have now followed her example. The profits from her farm have allowed Sister Martha to support 12 local orphaned children, providing them with food and shelter. Thanks to your support, we can help incredible women like Sister Waziri to overcome the challenges they face and continue to feed their families and their communities. Last year’s winner was Esther Jerome Mtegule from Iyenge in central Tanzania. She was one of the inspirational women who our Ending Poverty Starts with Women campaign ambassador Sharon Corr met in Tanzania. Video of Happy International Women&#039;s Day! Ester had managed to increase the yield of one of her crops from five to 75 bags a year by growing a drought-resistant variety instead of using the traditional one favoured by most farmers. This helped feed her whole village. Her achievement received mass-media coverage and led to her travelling internationally to talk about the vital role of small-scale women farmers. "I will do everything to support women food producers. They bring peace and harmony in their families and a nation at large," Ester explains. "And they bring freedom. I assure you that a food insecure family is not a free family." Your support is helping women to empower themselves and become decision-makers in their communities. Thank you. The world produces enough food to feed everyone – but not everyone has enough to eat. That has inspired Oxfam and 100 other organisations to mount a huge joint campaign on hunger. Enough Food for Everyone IF is about ending the greatest scandal of our age – that one in eight people go to bed hungry every night in a world which produces enough food for everyone. CAPTIONS: Top: IF comes together at the Belfast launch. Middle-left: Enough Food For Everyone IF we use land for food not fuel. Women pictured here in a garden program at the Integrated health Centre in Aguie in the Tessaoua region of Niger. Photo: Nyani Quarmyne. Middle-right: Six-month-old Maniratou Mahamadou, held by her mother, Habsatou Salou, smiles after a nutrition screening at the Boukoki Integrated Health Centre in Niamey, the capital. Enough for everyone IF we give enough aid to stop children dying of hunger. Photo: Nyani Quarmyne. Bottom row: IF teaser's spelt out using food, piano keys and inflated at Derry Peace Bridge. More than 140 people spelt it out in Belfast in January to unveil the IF campaign and be the first to sign up. You may have missed the wet shoes and standing around in the snow – but you can sign up too right here and find out the latest on the campaign here. Hunger kills more people than AIDS, malaria and tuberculosis combined. Two million children die each year because of malnutrition. Food prices continue to rise making it even harder for families, including here at home, to put food on the table. The food system is broken. IF we give enough aid to stop children dying from hunger and help the poorest families have enough food to live. IF we stop poor farmers being forced off their land, and we grow crops to feed people not fuel cars. IF we force governments and investors are open and honest about the actions that prevent people getting enough food. We need you to join us to end the scandal of hunger. Leaders – coming to Fermanagh for the G8 in June - will listen IF we act together and act now. Read more about What’s IF all about? Ireland will take centre stage in 2013. For the first six months of the year we hold the Presidency of the European Union. In June, leaders of some of the world’s most powerful countries will come to a quiet corner of Lough Erne, Fermanagh, for the G8 Summit to discuss the issues that affect us all. This is our moment to shine – a rare opportunity for this small island to set the agenda and shape international discussions. With your support, Oxfam Ireland will be working hard to ensure this moment is a catalyst for a better future for the world’s poorest people. Each and every individual here in Ireland can help to make that difference. We’re committed to responding to humanitarian emergencies and helping people cope with natural disasters, famine and war… but it’s not enough. We support long-term development to improve the lives and livelihoods of millions through better farming and greater access to education and health services …but that’s still not enough. For real, lasting change and a world where no one needs to die or live in poverty simply because of the circumstances they were born into, we must tackle the underlying inequalities and root causes of poverty. We need to use our voice and influence to change the way international systems and national governments see and do things. Campaigning for change is something we do here in Ireland and around the world. Top: Dressed as Homer Simpson, campaigners from Stop Climate Chaos – a coalition of NGOs including Oxfam Ireland – protested outside government buildings in Dublin last November to show how the UN Climate Change Summit taking place a week later in Doha was more likely to be a case of ‘Doh-a’! Mark Stedman/Photocall Ireland. 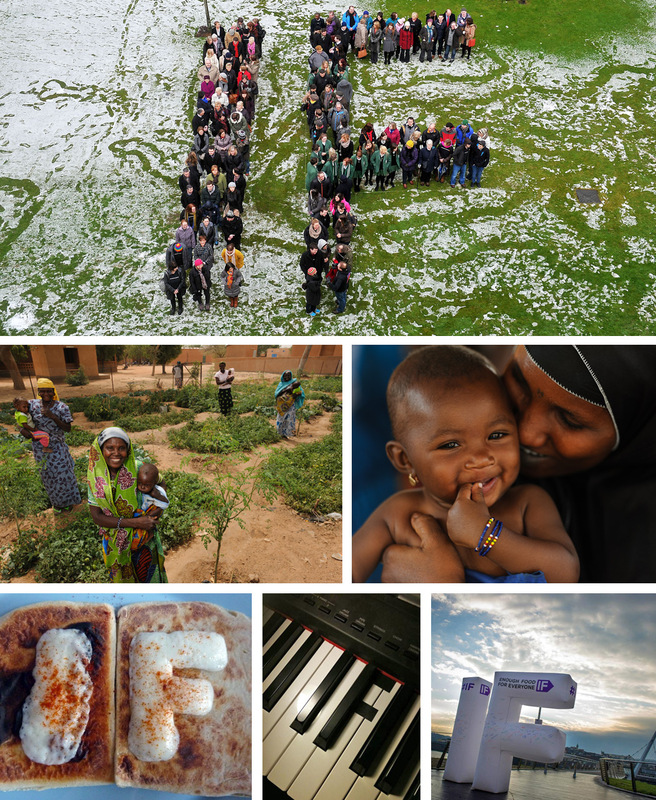 Upper-left: Oxfam Ireland joins other development agencies for the Act Now 2015 appeal to the Irish government to keep its promises on overseas aid, which is supported by eight out of 10 people. Mark Stedman/Photocall Ireland. Upper-right: Oxfam campaigners in Belfast demonstrate how Fairtrade goes with everything during Fairtrade Fortnight 2012. Brian Thompson/Presseye. Lower-left: Festival-goers at last summer’s Electric Picnic show their support for our Ending Poverty Starts with Women campaign. Ger Murphy/Oxfam. Lower-right: Campaigners from the Stop Climate Chaos coalition of NGOs which includes Oxfam Ireland make some noise by blowing hundreds of vuvuzelas outside the Dáil in November 2011 to highlight the slow pace of political action to combat climate change. Ger Murphy/Oxfam. Take Tanzania, for example. Not only do we support poor and marginalised communities in building a brighter future (e.g. by making a sustainable living through new farming techniques or helping those living with HIV and AIDS to access healthcare) but we are also helping to amplify their voices and ensure they are heard. For example, we’re supporting Maasai communities so that they are equipped to take part in a national discussion about the new Tanzanian constitution – ensuring that they can put forward their case for new guarantees ensuring they won’t be moved from their land and that their rights will be respected. 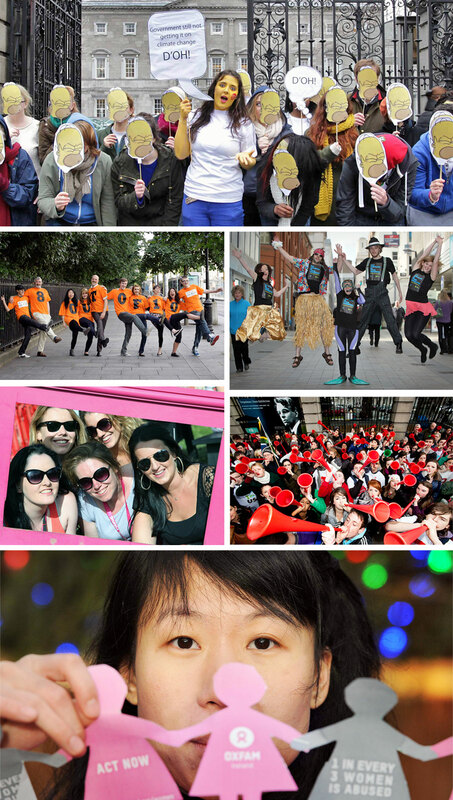 In 2012, thousands of people joined Oxfam Ireland to campaign for change for the first time. And as the world focuses on events here throughout the year, we can’t wait for the big and bold challenge in 2013 that we are ready to rise to and eager to face. Why not join us and be part of something amazing in 2013? 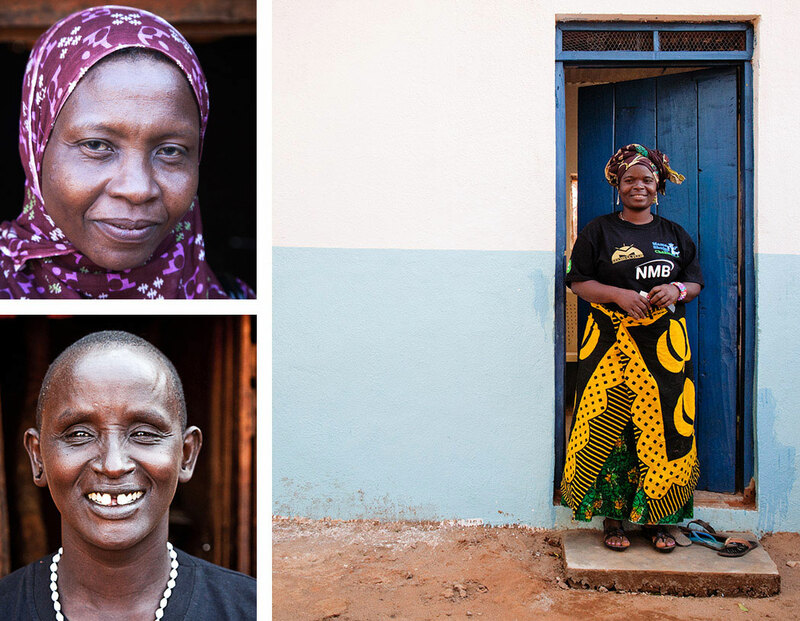 As part of our Ending Poverty Starts with Women campaign, our ambassador Sharon Corr and acclaimed photographer Barry McCall travelled to Tanzania to see how we’re helping women to stand up for their rights. Oxfam's own Communications and Marketing Executive Clare Quinlan travelled with Sharon to see how your donations are making a difference. Here's her account of the trip. A chorus of singers welcomed us as we arrived. Their voices filled the air, creating a sense of celebration and excitement. The reason for our visit to Lyenge village – part of a week-long trip to Tanzania – was to meet Ester Jerome Mtegule and other inspirational women who are shaping the future of their communities. Ester was the winner of our Female Food Heroes competition in 2011. It reached around 25 million Tanzanians – more than half the country’s population – through television, radio and newspapers. This year’s contest was being launched on her home turf, and Sharon was invited to Lyenge as the guest of honour. The reason why Female Food Heroes is so important is because it celebrates the role played by women who farm and produce food. Women are at the heart of Oxfam’s work – they make up 43 per cent of the agricultural workforce in the countries where we work, but often face discrimination when trying to get ownership of the land they farm. Our Ending Poverty Starts with Women campaign is calling for better support for women food producers so that they can become leaders in their own communities. Because of widespread media coverage in Tanzania, the Female Food Heroes competition brought important issues to national attention. Ester and her fellow finalists – whittled down to 10 from 7,000 entrants by a panel of expert judges and a public vote by 10,000 people – participated in a week-long X Factor-style ‘boot camp’ where they received training to enhance their existing skills in farming and food production. Following a public vote, Ester was awarded first place. She proudly showed us the tractor that she won and also the grain store that she now manages on behalf of her community. During the time we spent with Ester she warmly welcomed us into her home, where she wrapped Sharon’s hair into a traditional African headscarf and showed her how to grind maize, one of the staple foods in Tanzania. The impact of the Female Food Heroes competition on Ester's life has been remarkable and she's now become the farmers’ representative on her local district council. She's also using her prize of a tractor to help others in her community and so far, 10 other farmers have benefited from use of the machine. She has become a beacon of hope for all in her community. We also met the two runners-up of the 2011 competition, Anna Oloshuro Kalaita and Mwandiwe Makame, each of whom won solar panels. They told us how their lives have changed as a result. They are using their prizes to benefit other women in their communities in a number of ways, such as charging household lamps. Throughout the visit, Sharon showed great compassion and empathy towards everyone she met. You can see her meeting Ester and other Female Food Heroes in the video below. In Lyenge, we had arrived to the sounds of women singing in harmony. We left with an insight into how much is achieved when women can be empowered to come together and build a better future for their communities.